Boone was born in Pennsylvania but moved to the North Carolina frontier and made his living as a far-ranging hunter and trapper. 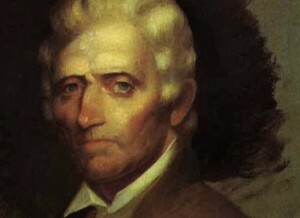 Contrary to popular belief, he did not “discover” Kentucky, but he did explore and settle a part of it, blazing a trail through Cumberland Gap, thereby opening Kentucky and the rest of the trans-Appalachian West to widespread settlement. Always courageous, always resourceful, Boone fought in the French and Indian War as well as the Revolution, laid claim to vast tracts of wilderness, and earned legendary fame even during his lifetime —yet he failed financially and died in relative obscurity on the Missouri frontier.